Home > News > Arsenal vs United:Wenger and Mourinho go again. 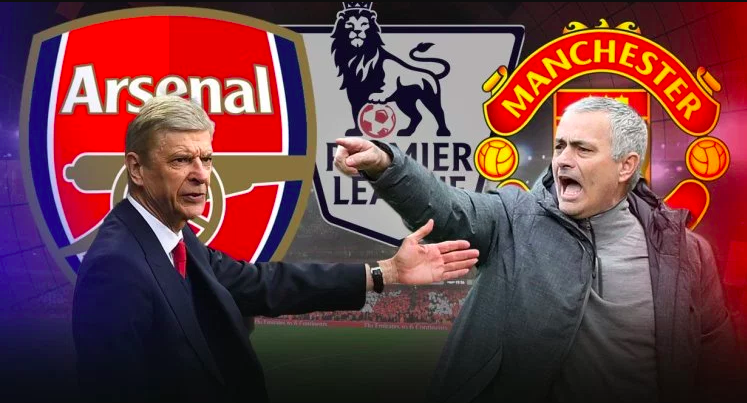 Arsenal boss Arsene Wenger is set to renew his long standing rivalry with Manchester United gaffer Jose Mourinho, as the Gunners host United in what promises to be a cracker of a match this Saturday. Here is our match preview by Neeraj Nair. Arsenal have been in great form since their comfortable 2-0 victory against Tottenham Hotspurs, and have now climbed up to the 4th spot full of confidence. The Gunners recently ran riot against Huddersfield with a convincing 5-0 win this Wednesday, with Mesut Ozil being at the heart of it. Ozil’s form has peaked at the right time and with Lacazette absent for this fixture, the Arsenal boss will hope his forward line comes good against the best defensive side in the League. Up against them are a confident United side who have won their last 3 Premier League fixtures including a ruthless 4-2 win against Watford this Tuesday. Mourinho will be hoping his side will show the same structural organisation again this Saturday as they continue to apply pressure on the Premier League leader Manchester City, and cannot afford a slip up. In what comes as a huge blow for Arsene Wenger, in form striker Alexandre Lacazette is set to miss the crunch fixture as he is ruled out due to groin strain. Either Giroud or Welbeck is expected to replace the Frenchman this Sunday, although Wenger may be tempted to hand Welbeck a start on the back of his impressive record against his former club. No other fresh injury concern for the Gunners. Santi Cazorla remains on the sideline. Mourinho’s biggest concern will be the availability of Nemanja Matic, who wobbled off in United’s previous fixture against Watford and is doubtful ahead of the fixture. Marouane Fellaini also missed the Watford fixture due to injury, while club captain Michael Carrick continues his recovery after a heart procedure that has limited him to just one appearance for the club.Defensive duo Phil Jones and Eric Bailly are ruled out of the big clash. The Curious case of Mesut Ozil. Since Arsenal’s comprehensive win against Tottenham , Mesut Ozil has been in the form of his life with two goals and five assists in his last five Premier League games. In Arsenal’s previous fixture against Huddersfield, Ozil contributed to three of Arsenal’s five goals and on his day, can rip apart defences with ease.The United defence will have to be really careful when it comes to dealing with the German and he will be key to Arsene Wenger’s game plan against Mourinho’s men. Ashley Young has experienced a renaissance this season and he’ll be looking inflict damage on Wenger’s men. It’s a sort of a rebirth for the England International in recent weeks. 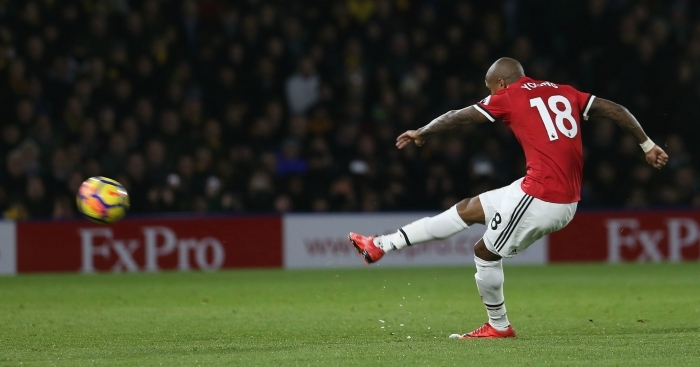 Young is in the form of his life and is thriving in his fullback/wingback position , and has been instrumental in United’s run of three consecutive wins including a double against his former club Watford. His ability to link the transition between defence and attack will be key for Mourinho as the Portugese will look to exploit Arsenal’s relative weak link – their defence. If Mourinho does opt to play a counter attacking game, then Ashley Young, along with teammates Paul Pogba and Anthony Martial, will be key to United’s success. The two juggernauts of English football had previously met a total of 225 times in all English top flight competitions, with United emerging victorious on 96 occasions. Arsenal was successful in defeating the club from Old Trafford on 82 occasions, while the remaining 47 fixtures ended in a draw. Meanwhile , Wenger has won just two of the seventeen times he faced a Mourinho team, while the Portugese emerged victorious on 8 different occasions. The last time the two clubs met was back in May where Arsenal emerged victorious over a makeshift United squad with a convincing 2-0 victory courtesy of goals from Granit Xhaka and former Red Danny Welbeck. Both Manchester United and Arsenal are in good form ahead of the crunch fixture at the Emirates. Since Arsenal’s disappointing loss against Watford , Arsene Wenger’s men have looked good with some convincing performances. They have won 12 games in a row at home, so United will have to step up against a team that has looked good since their North London Derby win. Meanwhile United have won their last three games on the trot, coinciding with Paul Pogba’s return to the squad after a two month lay off. Although United’s away record, especially against a top 6 squad hasn’t been great since Mourinho took charge, one can never count the club from Old Trafford out, with the abundance of talent in the squad. As Arsene Wenger puts it, “Man United is doing well at the moment, we are doing well at the moment, so it looks to be a promising game.” With the famous rivalry between the managers still in tact, It sure promises to be a cracker of a game. The post Arsenal vs United:Wenger and Mourinho go again. appeared first on El Arte Del Futbol.